Venetian Carnevale fever hits Temple Bar currently, and as interesting as it may be, this image was taken outside an adult entertainment premises. Sure, they are as colourful as some of those paraded in Italy coming up to Mardi Gras, but they also come with interesting price tags. 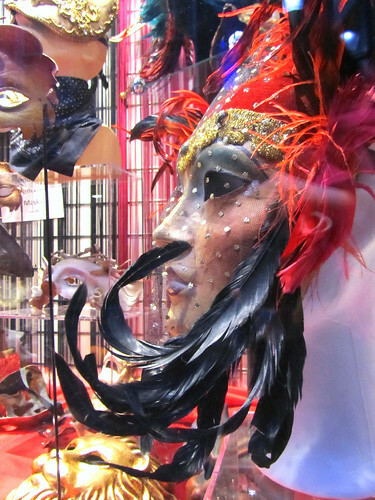 I must admit, I miss the real Venetian Carnevale. A city full of revellers, and mysterious figures strolling the alleys and canalways of Venice in controlled steps, pausing every so often to be photographed and idolised. Caught in the moment, I once even had my face painted with semi-mask in blue. Unfortunately, those were the days when there wasn’t any Avatar to make bright blue a popular face colour, and I had to catch a train from Venice to Milan looking whichever way I did. For the few hours, I was attracting wrong attention – plenty of stares and even a stalking guy, hmmmm.